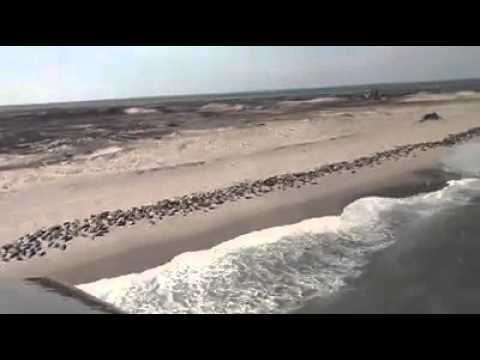 Have you seen the video that’s gone viral of tens of thousands of seals who pulled out off Cape Cod on Monomoy Island, part of Monomoy National Wildlife Refuge? Even the National Wildlife Federation’s veteran wildlife experts were blown away. As NOAA details: “The Gulf of Maine and Georges Bank shelf regions in particular are essential summer feeding grounds for large whales including humpback, fin, sei, minke, and North Atlantic right whales; smaller toothed whales including harbor porpoise, short-beaked common dolphin, Atlantic white-sided dolphin, offshore bottlenose dolphin, short-finned and long-finned pilot whales, and seal species including harbor and gray seals. The numbers of harbor and gray seals on the U.S. NES LME have increased in recent years where some seals are present year-round (Figure 7.2), though they migrate within and outside of the NES. These seal populations eat a wide variety of fish and invertebrates, and despite controversy over consumption of Atlantic cod, they tend to primarily consume small pelagic fish, hakes and flatfish. NWF’s Northeast Regional Center works to protect wildlife from seal and endangered North Atlantic right whales on the coast to moose and bobcats in our deep woods. Please make a generous donation today to help protect our wildlife, waters and forests!